Want to get your hands on a glider before committing to the P2 course? Then the Intro Lesson is for you. During this 3-4 hour lesson you will learn about the equipment, methods of forward and reverse launching, and techniques for proper ground handling. The entire cost of the intro lesson may be applied towards a Novice P2 Flight Package. Earn your wings. Appropriate for folks who have never touched a paraglider, our Novice Package is the gateway to a lifetime of free-flight adventure. 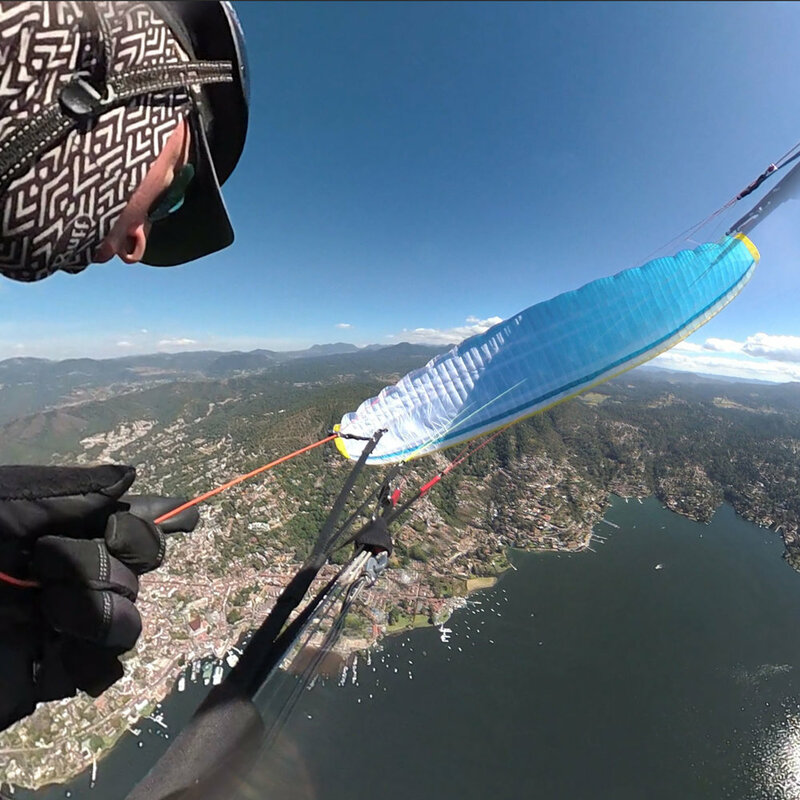 In this intensive course you will learn about the dynamics of flight and become proficient at kiting, launching, flying, and landing a paraglider. Expect to spend time studying in the classroom and lots of ground school practice, flying the paraglider like a kite. You will learn about weather and decision making strategies to enable a long, successful paragliding career. The P2 course can be done in 3 weeks or 18 months depending on the weather, pilot aptitude, and how much time & effort students spend practicing and studying at home. Students will learn on our excellent modern beginner gliders, harnesses, helmets, and radios. Paraglide New England also uses industry-leading tow mechanisms for both over-ground and over-water towing. During training, PGNE will help students select, setup, and transition to appropriate equipment for use after graduation. There’s many options for different budgets and pilot attitudes and we are keen to help you make a good choice! Bring a Friend: Receive $100 off per person. Gear Credit: Take $300 off a new wing and $100 off a new harness. Travel Discount: Take $200 off an international PG trip. Paragliding lessons are highly weather dependent. We start classroom instruction in the winter when there is no flying and continue it on an as need basis. As soon as the snow melts (or perhaps a little before!) we will begin teaching “ground school” and flight lessons. This will continue throughout the year until Dec when we start guiding international trips to warmer places. When the weather cooperates (not too windy, no precipitation), we primarily teach new pilots M-F from 7-9AM and again 4:30-sunset. The early and later hours are because this is when the air is suitable for new pilots, before and after the solar heating. We teach beginner lessons midweek because on the weekends we primarily teach mountain flying and “maneuvers training” (towing over the lake) to experience pilots, which are all day events. On the weekends, new pilots are always encouraged to come watch the mountain flying or maneuvers training as there is much to learn just by watching and we can often take you for a free tandem flight… but we ask that new pilots understand the vast majority of their training sessions will be midweek. For this reason, we suggest new students live within 2 hours of Westford, Vermont. So you’ve earned your P2 pilot rating (with us or elsewhere) and you know how to launch and land... But what is the next step? Our Soaring package will help you take your novice skills to the next level so you can confidently soar in the mountains. We will refine your skills and teach you the subtleties of mountain & thermal flying dynamics. Additionally, because we believe over-the-water maneuvers training is a vital element of continuing education, we include a 3-4 day SIV clinic. This package is the best way to ensure a smooth from novice skills to becoming a confident and independent mountain pilot. Travel Discount: Take $300 off an international PG trip. 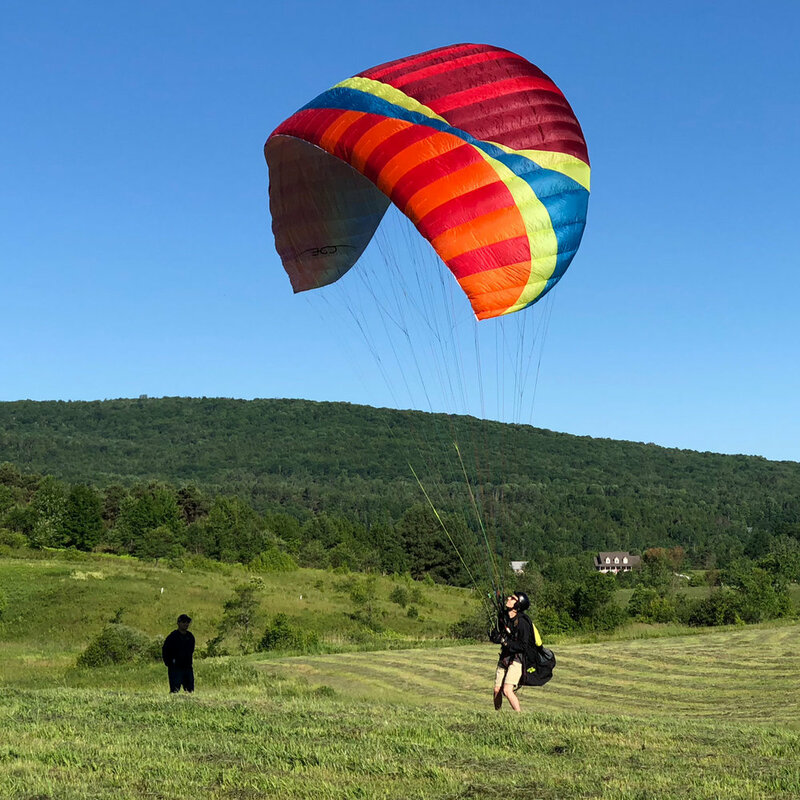 We teach soaring lessons on the weekends, whenever the weather cooperates in the flyable season, which depends on the snow fall but is typically April until Dec. If you’ve got a P3 and are ready take your skills to the next level, the Ace Package is for you. Learning acro, refining your soaring, and/or expanding your XC horizons, whatever your goals, PGNE is excited to help you get there. We teach Ace Package lessons on the weekends, whenever the weather cooperates in the flyable season, which depends on the snow fall but is typically April until Dec.
All mountain pilots should do at least one SIV per year to build the confidence and muscle memory necessary to deal with the inevitable in-flight incidents. Plus it is crucial for soaring pilots to be well practiced at getting out of the sky in hurry. This clinic will open your mind and revolutionize your flying. We all hope to never throw our reserve parachutes, but if your time comes, you want it to work! Having your reserve checked and repacked at least annually is crucial to ensuring a timely, reliable deployment. Many manufacturers recommend repacking once every 150 days and you should also repack anytime your chute gets wet. With over 4,000 skydiving jumps, our Tandem Instructor Andrey Kuznetsov knows exactly how to pack a chute. Andrey can repack for you via a mail-order service or you can join him for a hands on lesson. Rogallo chutes (like the Beamer) take twice as long and therefore cost $90. Square chutes and hybrid chutes cost $75. Whether you have ambitions of soaring solo or you just want to learn about paragliding with somebody else "at the wheel", a tandem instructional flight is an ideal place to start. We fly tandems in the mountains and tow over Lake Champlain with a winch in a boat. If you go on to be a solo pilot, the flights, hours, and cost of your tandem can be applied towards your P2 rating. Click the button below to sign up and we will reach out when there is an opportunity to fly. Paragliding is completely weather dependent. Passengers can pick tentative dates, but please understand that we can not confirm flight reservations until a few days in advance when the weather forecast is more accurate. All paragliding tandem flights in the USA are conducted under USHPA Excemption 4721 to Federal Aviation Regulation Part 103. This exception allows 2 person flight on our ultra-light aircraft for INSTRUCTIONAL PURPOSES ONLY... so we give tandem flight lessons, not joyrides. *Aspiring solo pilots, don’t let $ hold you back! PGNE is in the game first and foremost to spread the love of paragliding, so if you’ve got the passion we are keen to work with you. Payment plans, financial aid packages, barters, work trades, and "bro deals" are available. Please enquire.